Wiseman "Death Phantom, Doom Phantom"
Death Phantom, who calls himself Wiseman, is an immortal form of Chaos from the future. In the English version of the anime, he is called Doom Phantom. In the manga, Death Phantom was originally a human who lived in the time of the future kingdom of Crystal Tokyo, and possessed dark powers which he used to wreak havoc upon the citizens of Crystal Tokyo. These powers were: his death hands; able to reach insurmountable distances to attack people, and his evil vision, capable of controlling the minds of others by simply looking at them. He was banished to the barren tenth planet, Nemesis, by Neo-Queen Serenity. Over an unspecified period of time, Death Phantom managed to merge his spirit with the planet and became one with Nemesis. He cloaked his decayed and crumbling human body, and reached out psychically to Earth in order to look for discontent. He convinced certain denizens of earth that the 30th century utopia of Crystal Tokyo was an abomination against nature, as all of its citizens were given immortality through the power of the Silver Crystal. Thus the Black Moon Clan was born. 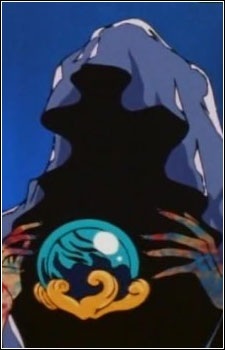 Calling himself the Wiseman, Death Phantom lead their way into a near fatal attack on Crystal Tokyo, and then into the past of Sailor Moon's time in order to obtain the Silver Crystal and have his revenge. Death Phantom cares little for his pawns; he manipulates them and sends the young traitors to their deaths, and even kills Rubeus himself. When faced with a new conduit for power, in the form of Chibiusa, he fills her with dark energy and she becomes his Black Lady. When Demand finally comes to his senses and blasts the Wiseman with all of his strength, the decayed body shatters; but Black Lady only laughs, before revealing that Wiseman is Nemesis. When all of his followers are gone, and Black Lady reverts to Sailor Chibi Moon, he creates a dark energy swirl to kill the Sailor Senshi, Sailor Moon and Chibi Moon attack the planet with a Double Moon Princess Halation and he is destroyed. In the anime, Death Phantom first approached Prince Demand when he was significantly younger. The Black Moon Clan were the descendants of traitors who had been exiled to Nemesis centuries before by Neo-Queen Serenity and King Endymion of Crystal Tokyo; and, posing as Wiseman, the Death Phantom manipulated them into gathering power for himself. He promised them that he could give them the power and ability to go to Earth and appeal directly to Neo-Queen Serenity to gain amnesty for the citizens of Nemesis, who had committed no crimes themselves. However, Wiseman's influence slowly warped the minds of his pawns until they carried out his plan for revenge and the ultimate destruction of the planet Earth. The Wiseman personally counsels Rubeus during his mission for a long time, but is all the same unconcerned about his death. He condescendingly humiliates Esmeraude when she comes to him asking to be the queen of Nemesis, and thus brings about her transformation into a hideous dragon and, ultimately, her death. He manipulates Chibiusa's childhood memories in order to make her into Black Lady. Wiseman then kills Saphir when Saphir realizes that he and his brother have been lied to. In the end, Death Phantom is destroyed, but Nemesis and its inhabitants aren't.